(VALDIVIA, CHILE) The U18 men wrap up their group stage with a huge second half showing over Brazil, ultimately winning 74-58. This secures Canada a 3-0 record and a first overall finish in Group A. 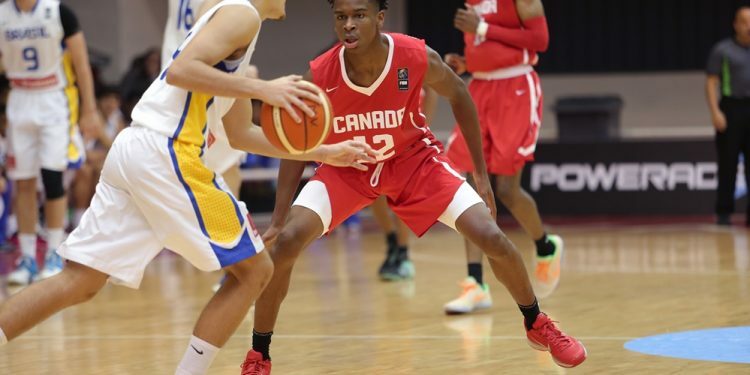 Starting for Canada were Abu Kigab, Nickeil Walker, Shai Alexander, Josip Vrankic and O’Shae Brissett. Click here for full team roster. Quick to rebound after coming off his Senior Men’s Team debut, Shai Alexander was able to finish with a double double, accounting for 12 points and 11 assists in 32 minutes of play. He also had a helping hand from teammates O’Shae Brissett and Nickeil Walker, each playing extended minutes and also finding the net for double digits. Bench scoring also proved vital putting in an additional 18 points. Canada’s offensive firepower in the second half is to credit for this win, shooting over 40% from the arc and ultimately outscoring Brazil 48-27 in the second frame. Both teams had traded buckets throughout the first quarter, which Canada finished with the slight lead of 15-13. Outscoring Canada in the second quarter 18-11, Brazil was able to retake a 31-26 lead heading into half time. Coming out with purpose to start the second half, the Canadian’s were able to find the net and handily jump ahead by putting up 29 points in the third quarter alone. Leading with a score of 55-46 headed into the fourth quarter, Canada maintained momentum and scored 8 straight points before Brazil was able to find the scoreboard. Brazil attempted to climb, but it was the Canadian’s that prevailed in this one, orchestrating their way to a first overall finish in Group A with the 74-58 win. Canada will take on Puerto Rico today at 6:00pm ET in the semi-final round.